A huge, ferocious spiritual hurricane is about hit America the likes of which we have never seen or ever experienced. I believe this will be financial, but it will also cover all other areas as well. There will be persecution, famine, disease and every conceivable form of darkness. This could also represent a natural hurricane that will be off the charts or something else that happens in the gulf. Whatever it is, this coming storm will cause much destruction, chaos and grief. Hurricane Irma has partially fulfilled this vision. 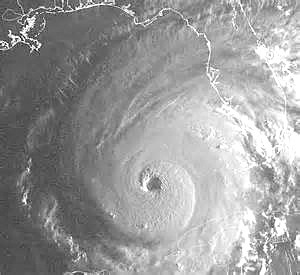 Most reports are now saying that this strom was monster storm five times as large as Andrew in 1992. I believe that this storm was just a warning and much worse storms are coming in the near future to batter not only Florida, but other parts of the country as well. Make sure you are right with God. Give your life to Jesus Christ before it is too late. He loves you and does not want you to perish. Luke 21:25-26 "And there shall be signs in the sun, and in the moon, and in the stars; and upon the earth distress of nations, with perplexity; the sea and the waves roaring; Men's hearts failing them for fear, and for looking toward those things which are coming on the earth: for the powers of heaven shall be shaken." John 3:16-19 For God so loved the world, that he gave his only begotten Son, that whosoever believes in him should not perish, but have everlasting life. For God sent not his Son into the world to condemn the world; but that the world through him might be saved. He that believes on him is not condemned: but he that believes not is condemned already, because he has not believed in the name of the only begotten Son of God. And this is the condemnation, that light is come into the world, and men loved darkness rather than light, because their deeds were evil.